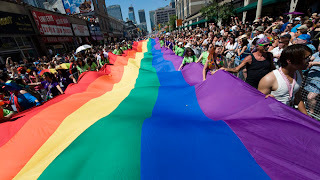 Pride Week Toronto is a ten day event held annually during the last week of June in Toronto. The week is a celebration of the LGBT community and is one of the largest pride festivals in the world. Pride week has been held annually since 1981. This year marks the 32nd annual Pride Week in Toronto. Toronto’s pride week grew out of a vibrant political and grassroots history. On February 5, 1981 the Toronto Metropolitan Police under took the second largest mass arrest in Canadian history (the largest being during the FLQ crisis). Titled ‘operation soap’, this mass arrest targeted bathhouses across Toronto and resulted in the arrest of over 300 gay men. The reaction from the general public and the LGBT community resulted in mass protests and demonstrations across Toronto. The days following the mass arrest resulted in number of rallies ending in violence between the protesters and police. The removal of badges by police and use of excessive force (think G20 protests) was seen throughout the city. The rallies were the earliest incarnations of Toronto Pride Week. The rallies were the beginning of raising public awareness about discrimination and queer issues. Since 1981, Pride Toronto has developed into a vibrant celebration drawing people from across Canada. Pride Week has also raised awareness for major milestones in the LGBT community, such as: sexual orientation has been included in the human rights code (1987), Toronto City Council proclaimed Pride Day for the first time (1991), and the first Dyke March was held in Toronto (1996). Despite huge attendance numbers and some level of community acceptance, Pride Toronto hasn’t been without opposition or controversy in in the recent past. In 2010 Pride Toronto’s decisions regarding the inclusion of the group, Queers Against Israeli Apartheid (QuAIA) in the Pride Parade resulted in growing tensions between Pride and the Toronto City Council. In March 2011, Rob Ford, Mayor of Toronto, proclaimed that the Pride Parade would not by eeligible for city funding if the QuAIA were allowed to march in the parade. This statement was later rebutted by the Toronto City Manager who said that Toronto cannot cannot “conclude that the use of term on signs or banners to identify QuAIA constitutes the promotion of hatred or seeks to incite discrimination contrary to the Code” and shouldn’t be able to restrict funds on this basis. The QuAIA withdrew voluntary from the pride parade in 2011 to avoid controversy, but in 2012 the same struggle for inclusion debate over city funding continued. Pride Toronto aims to celebrate the history, courage, diversity and future of Toronto’s LGBTTIQQ2SA (Lesbian, Gay, Bisexual, Transsexual, Transgender, Intersex, Queer/Questioning, 2 Spirited, Allies) communities. This celebration has risen out of a past rife with opposition and political contention, but continues to draw thousands to Toronto and flourish in the face of opposition. The historical and ongoing political strife surrounding Pride is a subject that hasn’t been fully explored by historians or the general public at this point, and is well deserving of further attention.